YSPN is a leader in Tournament Action Photography! Dedicated to providing amazing once in a lifetime images, and driven to be simply the best in Tournament Photography. This philosophy has propelled YSPN to the top of its field. We cover some of the largest and most prestigious events in youth sports. YSPN covers many of the largest youth sports tournaments in the country, some including as many as 500 teams. Over 2,000,000 sports photographs are shot each year. Multiple computer viewing stations, uniformed staff, banners, displays, and temporary fencing show that your league uses a true professional photography company. YSPN can produce custom photo borders for each event incorporating the events logo, colors, sponsors and location. Photos are sorted by team, enhanced, and posted for previewing in just minutes. We have multiple pro quality photo printers available onsite. Customer walk away with their prints. Our phone number and website are clearly displayed on all of our literature. Additionally, our lab is staffed seven days a week to answer calls. We proudly offer a 100% satisfaction guarantee. After the event, family and friends can view and purchase photos or products on our secure website. Photos, Posters, Event Borders, Photo Balls and More. Please visit our "Products" page to for a complete listing of specialty items. 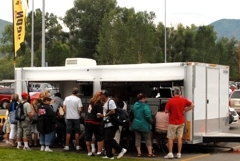 YSPN operates a state of the art viewing trailer. 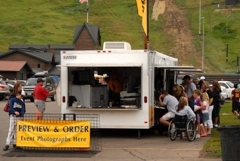 Our trailer boasts twelve viewing stations, multiple sales stations, and photo printers. It’s a one of a kind unit in the industry.